The painting is by Blessed Fra Angelico (1400-1455). Saint Peter is ordaining Stephen to the diaconate while Saint John the Beloved (whose feast we will keep tomorrow), holding his Gospel, looks on. The composition is remarkable: the three heads of Peter, John and Stephen form a triangle, a symbol of communion in the Three Divine Persons. Peter is handing over the chalice and paten; they are very large. 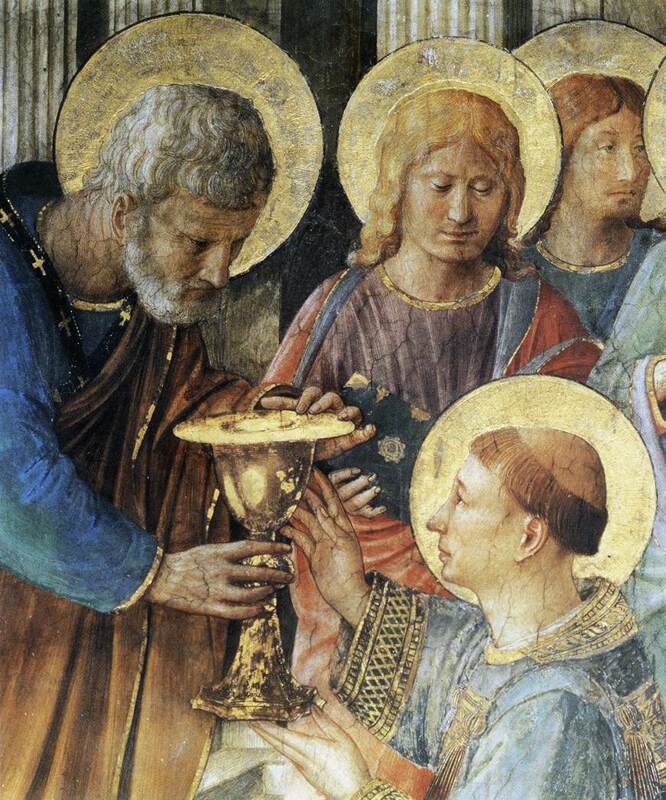 Fra Angelico makes the Most Holy Eucharist central; he paints what Saint Thomas Aquinas taught, i.e. that the unity of the Church is constituted and held together by participation in the adorable Body and Blood of Christ. Already on the First Sunday of Advent, we sang in the Benedictus Antiphon, “The Holy Spirit will come upon thee, O Mary. Do not be afraid.” And on the Second Saturday of Advent, Blessed Isaac of Stella explained that “what is said in the particular case of the Virgin Mother Mary, is rightly understood of the Virgin Mother Church universally (Sermon 51). Today’s feast of Saint Stephen is the liturgy’s way of repeating now to the Virgin Mother Church the mysterious words of the Angel Gabriel to the Virgin Mother Mary: “Fear not, for thou hast found grace with God.’ (Lk 1:30). It is remarkable that Saint Luke, the author of the Acts of the Apostles, describes Saint Stephen in today’s First Reading as “full of grace and power” (Ac 6:8). The phrase has a distinctively Marian resonance. To Mary, the “highly-favoured” of God (Lk 1:28), the “full of grace,” the angel Gabriel says: “The Holy Ghost shall come upon thee, and the power of the most High shall overshadow thee” (Lk 1:35). The words addressed to the Virgin Mary in a particular way hold universal import for the Church. On this second day of Christmas, Stephen, “full of grace and power”(Ac 6:8) is the radiant icon of the Church indwelt and overshadowed by the Holy Spirit. Without leaving Mary and the Infant Christ, we pass to Stephen and the Infant Christ, to Stephen and the Infant Church. Saint Luke tells us that those who disputed Stephen “could not withstand the wisdom and the Spirit with which he spoke” (Ac 6:10). Stephen of the growing Church, like Jesus at the age of twelve (Lk 2:42) opens his mouth in the midst of the people, the elders, and the scribes, and his utterance is evidence of the Holy Spirit sent to the Church in fulfillment of Jesus’ promises. “When the Counselor comes, whom I shall send to you from the Father, even the Spirit of Truth, who proceeds from the Father, he will bear witness to me” (Jn 15:26). Saint Matthew, in today’s Gospel expresses the same reality: “Do not be anxious how you are to speak or what you are to say; for what you are to say will be given to you in that hour; for it is not you who speak, but the Spirit of your Father speaking through you” (Mt 10:19-20). We generally interpret this promise of Our Lord as having to do with the witness given by those who are delivered up to the enemies of His name and persecuted for the sake of the Gospel, and this is indeed the first meaning of the text, but the use of the text in this liturgy of Saint Stephen suggests yet another meaning to us, one that is, at a first glance, perhaps less apparent. 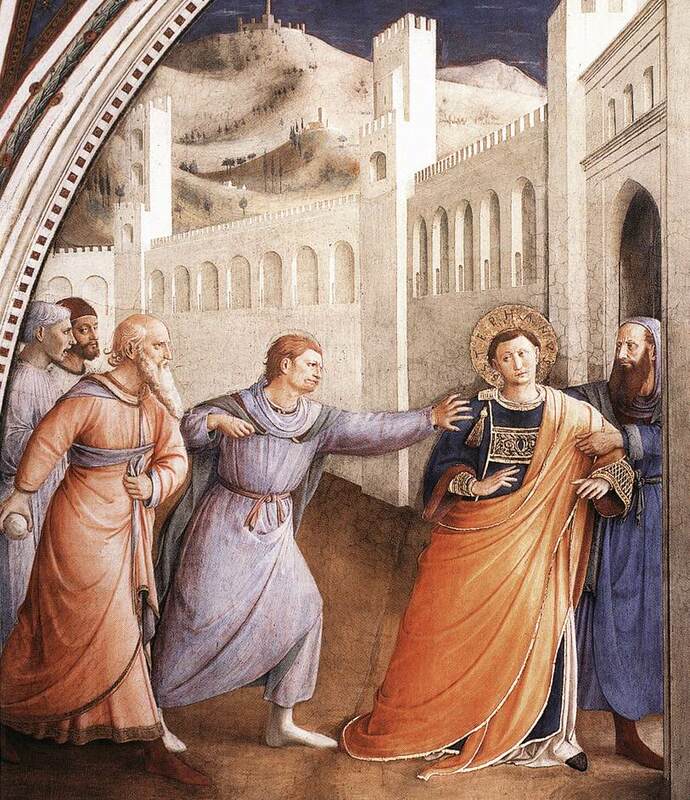 Saint Luke clarifies his initial description of Stephen as “full of grace and power” (Ac 6:8) by making it explicit in his description of Stephen’s martyrdom: “But he, full of the Holy Spirit, gazed into heaven and saw the glory of God, and Jesus standing at the right hand of God” (Ac 7:54). “Full of grace and power” is synonymous with “full of the Holy Spirit.” The effects of the indwelling and overshadowing of the Holy Spirit are that how we are to speak and what we are to say are given us by the Spirit of the Father in the hour of our need (Mt 10:19-20) and also that those who are “full of the Holy Spirit” gaze into heaven, see the glory of God, and Jesus standing at the right hand of God (Ac 7:54). The first effect corresponds to Saint Paul’s experience of the indwelling Holy Spirit. “The Spirit helps us in our weakness; for we do not know how to pray as we ought, but the Spirit himself intercedes for us with sighs too deep for words” (Rom 8:26). How we are to speak and what we are to say comes from the Holy Spirit not only when we are facing persecutors but also when we, gathered in Christ, are facing the Father in prayer. In both instances the Church is in need of the parrhesia; — the boldness — that comes from the Spirit. In her prayer, the Church indwelt and overshadowed by the Holy Spirit, the Church “full of grace and power” (Ac 6:8), knows how to speak and what to say, for the Spirit helps her in her weakness, giving her to pray as she ought. This is why in every festive liturgy the Church gazes into the heavens and seeing the glory of God and Jesus standing at the right hand of the Father, sings “Thou alone art the Holy One, thou alone art Lord, thou alone art the Most High: Jesus Christ, with the Holy Spirit: in the glory of God the Father” (Gloria). This is the second effect of the indwelling of the Holy Spirit. The Church-at-prayer sings what, with the eyes of faith, she beholds. The work of the Holy Spirit, first of all through the sacred liturgy, is to align us with the prayer of Christ to the Father, to empty us of all that is our own prayer — narrow, subjective, constrained — and to fill us with the utter fullness of the prayer of Christ, a prayer that is immense, universal, all-encompassing, all-powerful and always and everywhere pleasing to the Father. In his martyrdom, Saint Stephen reveals this. “As they were stoning Stephen, he prayed, ‘Lord Jesus, receive my spirit.” And he knelt down and cried with a loud voice, ‘Lord, do not hold this sin against them'” (Ac 7:59-60). Designedly, Saint Luke, in his account of the death of Stephen, reproduces his own account of the prayer of the dying Jesus from the cross. “Father, forgive them; for they know not what they do,” and “Father, into thy hands I commit my spirit” (Lk 23:34 and 46). There is, however, a subtle theological difference. Whereas the dying Jesus addresses the Father, the dying Stephen addresses the living Christ, the risen and ascended Jesus whom he beholds “standing at the right hand of God”(Ac 7:55). Stephen’s prayer at the hour of death is a confession of the resurrection of Christ. Poised between hearing the Word of God and going to the altar for the sacrifice, the Virgin Mother Mary and the protomartyr Saint Stephen are given us as living signs of the indwelling and overshadowing of the Holy Spirit. To us is said, “The Holy Spirit will come upon you and the power of the Holy Spirit will overshadow you” (Lk 1:35). To us is given, “wisdom and the Spirit” (Ac 6:10), which no earthly power or wisdom can withstand. By our communion in the Holy Sacrifice of Christ’s Body and Blood, we, like Saint Stephen, are filled with the Holy Spirit. Herein is the transforming effect of Holy Mass: we are no longer many individuals speaking many words and praying many prayers. We are, by the action of the Holy Spirit, a single Body with a single voice and signal prayer: the Body of Christ, the voice of Christ, the prayer of Christ. Amen. Stephen’s name means crown. He was the first disciple who died for his faith in Jesus. As chapters 6 and 7 of the Acts of the Apostles tells us, Stephen was chosen as a deacon in the early Church. Peter and the apostles had found that they needed helpers to look after the care of widows and the poor. So they ordained seven deacons and Stephen is the most famous of these. God worked many miracles through St. Stephen. He spoke with such wisdom and grace that many people who heard him, became followers of Jesus. The enemies of the Church of Jesus were furious to see how successful St. Stephen’s preaching was. They could not answer his wise arguments, so they laid a plot and got men to lie about him. These men said that he had spoken sinfully against God. St. Stephen faced that great gathering of enemies without any fear. In fact, the Holy Bible says that his face looked like the face of an angel. Stephen spoke about Jesus, showing that he is the Savior God had promised to send. He scolded his enemies for not having believed in Jesus. At that, they rose up in great anger and shouted at him. But Stephen looked up to heaven. He said that he saw the heavens opening and Jesus standing at the right hand of God. His enemies closed their ears and refused to listen to another word. Then they dragged St. Stephen outside the city of Jerusalem and stoned him to death. The saint prayed, “Lord Jesus, receive my spirit!” and he fell to his knees but begged God not to punish his enemies for killing him. Collect: Grant, Lord, we pray, that we may imitate what we worship, and so learn to love even our enemies, for we celebrate the heavenly birthday of a man who know how to pray even for his persecutors. Through our Lord Jesus Christ, your Son, who lives and reigns with you in the unity of the Holy Spirit, one God, for ever and ever. Today is the second day in the octave of Christmas. The Church celebrates the Feast of St. Stephen, the first Christian martyr. Stoned outside Jerusalem, he died praying for his executioners. He was one of the seven deacons who helped the apostles; he was “filled with faith and with the Holy Spirit,” and was “full of fortitude.” The Church draws a comparison between the disciple and his Master, emphasizing the imitation of Christ even unto the complete gift of self. His name is included in the Roman Canon. The deacon Stephen, stoned in Jerusalem two years after the death of Christ, has always been the object of very special veneration by the faithful. He is the first martyr. The account in the Acts of the Apostles relating his arrest and the accusations brought against him emphasize the parallel with our Saviour’s trial; he was stoned outside the city wall and died, like his Master, praying for his executioners. In St. Stephen, the first martyr, the liturgy emphasizes the imitator of Christ even to the extent of the complete gift of self, to the extent of that great charity which made him pray in his suffering for his executioners. By establishing the feast on the day after Christmas the Church draws an even closer comparison between the disciple and the Master and thus extends his witness to the whole mission of the redeeming Messiah. On the day after the solemnity of Christmas, we celebrate today the feast of St. Stephen, deacon and first martyr. At first glance, to join the memory of the “protomartyr” and the birth of the Redeemer might seem surprising because of the contrast between the peace and joy of Bethlehem and the tragedy of St. Stephen, stoned in Jerusalem during the first persecution against the nascent Church. In reality, this apparent opposition is surmounted if we analyze in greater depth the mystery of Christmas. The Child Jesus, lying in the cave, is the only-begotten Son of God who became man. He will save humanity by dying on the cross. Now we see Him in swaddling clothes in the manger; after His crucifixion, He will again be wrapped in bandages and placed in the sepulcher. It is no accident that the Christmas iconography sometimes represents the divine newborn Child lying in a small sarcophagus, to indicate that the Redeemer was born to die, He was born to give His life in ransom for all. St. Stephen was the first to follow in the steps of Christ with martyrdom: like the divine Master, he died forgiving and praying for his executioners (cf. Acts 7:60). During the first four centuries of Christianity all the saints venerated by the Church were martyrs. Also Mary, who took the Redeemer in her arms in Bethlehem, suffered an interior martyrdom. She shared His Passion and had to take Him, once again, in her arms when they took Him down from the cross. To this Mother, who felt the joy of the birth and the anguish of the death of her divine Son, we entrust those who are persecuted and those who are suffering, in different ways, for witnessing and serving the Gospel. With special spiritual closeness, I am also thinking of the Catholics who maintain their fidelity to the See of Peter without giving in to compromises, at times even at the cost of grave sufferings. The whole Church admires their example and prays that they will have the strength to persevere, knowing that their tribulations are a source of victory, though for the moment they might seem to be a failure. Patron: Casket makers; coffin makers; deacons; headaches; horses; masons; diocese of Owensboro, Kentucky; stone masons. Symbols: Deacon carrying a pile of rocks; deacon with rocks gathered in his vestments; deacon with rocks on his head; deacon with rocks or a book at hand; stones; palm of martyrdom. Read Pope John Paul II’s 2003 Angelus Message for the Feast of St. Stephen. “If you know what witness means, you understand why God brings St. Stephen, St. John, and the Holy Innocents to the crib in the cave as soon as Christ is born liturgically. To be a witness is to be a martyr. Holy Mother Church wishes us to realize that we were born in baptism to become Christ — He who was the world’s outstanding Martyr.” — Love Does Such Things, by Rev. M. Raymond, O.C.S.O. And, Stephen, full of grace and power, did great wonders and signs among the people. Then some of those who belonged to the synagogue of the Freedmen (as is was called), and of the Cyrenians, and of the Alexandrians, and of those from Cilicia and Asia, arose and disputed with Stephen. But they could not withstand the wisdom and the Spirit with which he spoke. At first glance, we might think that Stephen’s life was in vain. He had worked so hard for the Gospel, and yet his enemies prevailed. How could this be? Sometimes, God’s greatest servants are cut down before their time – or so it seems. But the ways of God are too complex for us to grasp. For example, one remote consequence of Stephen’s death was the conversion of St. Paul. Was Paul converted solely because he saw how Stephen had died (Acts 8:1)? No. but it was one of many extraordinary events that Paul witnessed – all of which testified to the power of the Gospel and helped prepare him for his encounter with Jesus. A word spoken, the witness given, a gesture of kindness, all of these can have the effect of a pebble dropped in a pond that sends out ripples far and wide. In this instance, it wasn’t really Stephen’s witness that began the ripples. His decision to forgive his killers was the fruit of the birth of a Baby in a stable in Bethlehem years earlier. Jesus’ incarnation was the pebble dropped in the pond which is still sending our ripples today, affecting the entire world. The call to evangelize can be intimidating. We can think that it all depends upon us. Of course, we should be alert to the testimony that our lives give to Jesus. But at the same time, we should remember that the Holy Spirit is in control. We are just one of many effects of Jesus’ becoming a man – one of many “ripples” in the pond. Like Stephen, we may be just one person in a series of many whom the Holy Spirit will use to bring others to Christ. Be assured that as you continue to witness, pray, share the Gospel, and serve, the Holy Spirit will be working. And when you get to heaven, you may be amazed at how many people are there with you in part because of your life. How grateful they will be! And how grateful will you be that God chose to use you so powerfully! Short Prayer: Heavenly Father, help me to get past my fear of evangelizing. By the power of Your Holy Spirit give me the heart of a person who wants to see others know the love of Jesus. Amen. Many are shocked to walk into daily Mass on December 26 and instead of hearing more of the “Baby Jesus” we are confronted with Martyrdom, “The Feast of Stephen” is ancient on the Church’s calendar. More ancient than the Christmas cycle and hence it was not removed to another time. Bu the martyrdom does not stop there. We are in the midst of the Christmas Octave, an Octave filled with blood as we shall see. What is an Octave? But first, there may be some of you who wonder what is meant by and “Octave.” An Octave is a period of eight days wherein a feast of the Church is celebrated for that whole period as though it were all the same day. In the modern liturgical calendar we only observe two octaves explicitly: Christmas and Easter. During the week following Christmas many of the prayers speak of each day as though it were still Christmas. For example some of the prayers and antiphons say, “Today is born our savior, Christ the Lord.” A purist might say, but it is NOT today that he is born, it was back on Saturday the 25th that he was born. But, in certain sense this IS still Christmas day. Christmas Day is one long day of eight days from Saturday the 25th to Saturday January 1st. Why eight days? Some say it is a reference to the eighth day on which Christ rose. I know, you thought it was the third day. But it was also the eighth day! For God made the world in seven days, resting on the seventh (Sabbath or Saturday). But Christ rose on the 8th day (Sunday). So resurrection morning is both the third day AND the eighth day! Others say the practice of the octave goes to Jewish times where some of the feasts (e.g. Dedication and Tabernacles (Booths)) were celebrated over 8 days. In the old calendar there were more Octaves such as: Epiphany, Pentecost, All Saints, Immaculate Conception, Ascension Sacred Heart and others). Not all of these were privileged Octaves in which no other feasts could be celebrated. Easter and Pentecost were really the only two that blocked out all other feasts entirely. Others, like the Christmas Octave, allowed the celebration of other feasts but still referred to the feast of the octave as well. So here we are in the Christmas Octave and, in a strong sense it is thus still Christmas Day. TODAY is born our savior Christ the Lord. This feast is so important that we stretch its observance a completed week and into the eighth day. Bloody Octave – But one of the striking things about the Christmas octave is its bloodiness. It is one of the bloodiest weeks of the Church’s years. Thus, on December 26th, when we have hardly digested our Christmas dinner, we celebrate the Feast of St. Stephen, the Martyr who was stoned to death. On December 28th we celebrate the Feast of the Holy Innocents, the young and infant boys who were murdered by Herod seeking to kill Christ. On December 29th we celebrate the feast of St. Thomas Becket who was murdered in Canterbury Cathedral. Even St. (King) Wenceslaus of whom we happily sing “on the Feast of Stephen” was brutally killed by his brother. Why all this blood, why this martyrdom? It is almost as though the red poinsettias that we put out in festive Christmas spirit look back to us in testimony. For it is clear that Jesus came to this world, ultimately to die. His crib (likely of wood) in which he was laid, arms and feet bound by swaddling clothes, points inevitably to the wood of his cross where, once again, his arms and legs were bound by nails and, after dying, he was wrapped tightly in a linen shroud. The blood of the Christmas octave also reminds us that many of us too will share in Christ’s lot. This world hated Christ and had “no room for him.” Neither does this world have room for true Christians and the blood of martyrs stretches down through the centuries in testimony to the world’s hatred for authentic disciples of Christ and the truth they propose. From this bloody octave the words of Christ ring out: If you belonged to the world, it would love you as its own. As it is, you do not belong to the world, but I have chosen you out of the world. That is why the world hates you (Jn 15:19). The martyrs of the Christmas Octave say, Amen. And even St. John the Apostle, whose feast also occurs in the Octave (Dec 27), also says Amen. For, though he did not suffer martyrdom he proclaimed his Amen also from his prison cell on Patmos: I, John, your brother and companion in the suffering and kingdom and patient endurance that are ours in Jesus, was on the island of Patmos because of the word of God and the testimony of Jesus (Rev 1:9). Victory – But all these martyrs and sufferers (St. Stephen, St. John, the Holy Innocents, St. Thomas Becket, and St Wenceslaus) proclaim too the victory that is theirs with Jesus Christ who also said, In the world ye shall have tribulation: but be of good cheer; I have overcome the world (Jn 16:33). And again, Do not be afraid of what you are about to suffer. I tell you, the devil will put some of you in prison to test you, and you will suffer persecution for ten days. Be faithful, even to the point of death, and I will give you life as your victor’s crown. (Rev 2:10) Yes, Lord, the Spirit and the Bride say, Amen. Did I wish you a merry Christmas?